What has most surprised me about full time RVing? The many industrious folks who kindly share handmade gifts with me are near the top of the delightful surprises list. 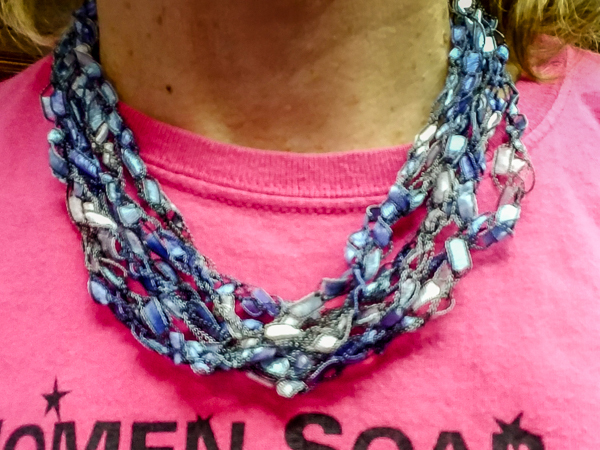 For instance, while on the road I received the featherlight ribbon necklace on the right from my friend Diane at the Balloon Fiesta. 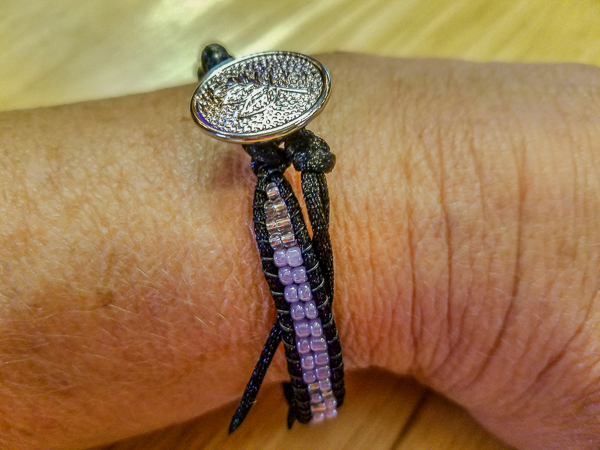 Tracie here in Moab presented me with the delicate beaded bracelet on the left. Tracie has an industrial grade sewing machine in her RV which she puts to good use making many remarkable things. I believe her next project is a set of wheel covers for her motorhome. 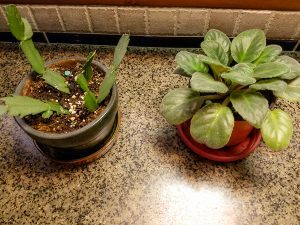 Sherry brought her green thumb on the road with her and was kind enough to transplant a couple of her fledgling plants into my care. I aspire to one day coax the African Violet that she gave me into blooming as she so easily seems to do. Not wanting to be left behind, Storm used his free time between making RV repairs to teach himself a new hobby. After seeing metal can tab hat bands being sported by other volunteers at the Balloon Fiesta, he began working on his first project last October. Never losing sight of his goal, he finally finished his first band (shown on the right) last week. 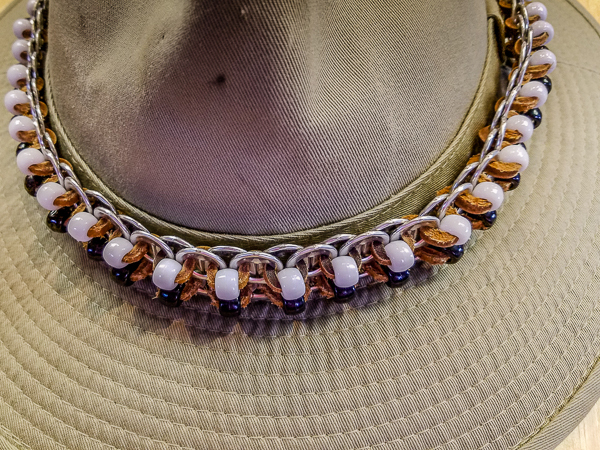 Want a handcrafted hat band for your chapeau? Just send Storm your name, address, the length of band that you need and ten cases of beer in cans (you choose the brand, he is not picky). After approximately 6 months from Storm’s receipt of your order, you too may very slightly possibly be the proud owner of a custom made “Band de Charles.” That all depends of course on how well the disposal of the cans and their contents goes for Storm during his secret pre-manufacturing process. I am lucky enough to meet adventurers and professional photographers Sue and Joe while were here in Moab. They kindly share with me some of their secrets and tips for improving my hobbyist efforts at photography. Although still hampered by my tendency to be asleep during the golden sunrise and sunset light, I am able to apply some of their lessons. 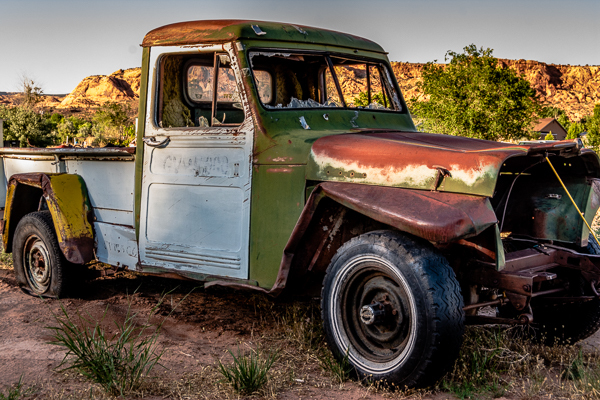 This photo of an 1950’s vintage Jeep Pickup truck I pass daily on my walks allowed me to use some of their editing techniques. Great Jeep pickup. I drove one just like that delivering car parts for Lewis Supply Company in High Point during my junior year in High School. Wow, does that bring back memories. Do you think Charles could fit that restorable in the trailer and haul it around until I get there? I will ask him! I am glad it brought back good memories and thrilled to hear from you. Great post! Laughed at the part about Storm’s hat band, but it sure looks nice. I agree, you meet so many interesting, talented folks on the road. Your truck photo looks fantastic and it looks like the plants are doing fine! Thank you! I think I may be close to coaxing a bloom from the violet!